This is Clif Richard. He is our cat. We found him at the San Francisco SPCA. Or should I say he found us. I can not imagine my life without him. He is now approaching 3 years young. He loves to be picked up and carried around the house when I come home. And I look forward to it. Clif loves to travel. I know this is unusual for most cats, but I think if you get them used to it when they are young then they don't know any different. When we travel, which is often, I simply put his carrier next to his litter box. When he sees this he goes into the litter box and empties himself then proudly walks into his carrier. While we drive, not even one "Meow". When we get to our destination, sometimes five hours have passed, I bring him into our pet friendly motel or pet friendly cabin and let him go. Traveling with a cat has always been pleasurable for us, and if you can I would recommend it. I can't imagine traveling without my best friends. He also loves the dogs very much, who also accompany us, and usually lays with them at night. He also truly believes they are inferior to him! I guess that is not unusual though. And no one complains. 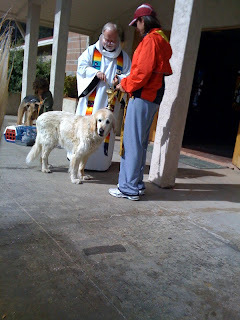 As pet lovers, we all need to remember how important it is to make sure our pets are blessed. All creatures of our God and King. Thou burning sun with golden beam. Ye clouds that sail in heaven along. Praise God and him cast your care. To edit and/or update your information follow the link to that page: http://www.barleyslist.org/ and Select Add/ Edit your business.